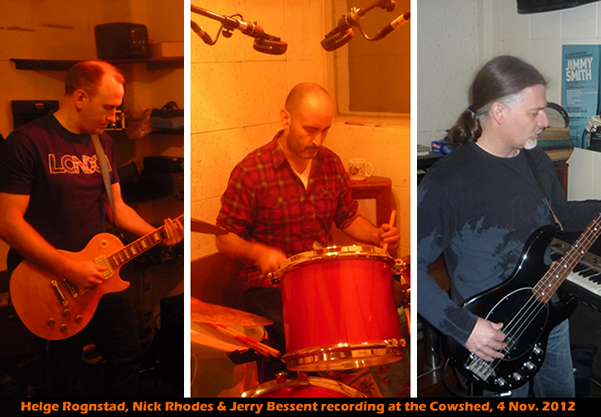 In November 2012, one year after our Sun Studio session, it was time for the next one at the Cowshed Studio in London UK. Here follows a background note about how the Cowshed session came together, what equipment was used and how the songs “Vigilante Man” and “Mean ol’ Frisco” came into being (available on the Fighting Demons album).. Joining me for this session would be Fluffy Jackets’ bass player Jerry Bessent, drummer Nick Rhodes and harmonica player West Weston. 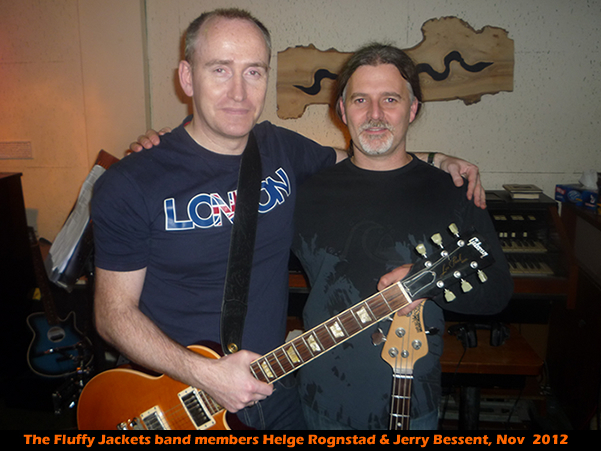 Jerry is a long time Fluffy Jackets band member, having played bass on all our live gigs from late 2007 onwards. Nick Rhodes claim to fame is that he once played drums with 5TA, a band that was signed to Artista Records and appeared on BBC's chart show Top of Top of the Pops back in the 1980s. In any case, I found out that Nick still had some drum-kits in his loft and managed to trick him out of retirement for this album. The renowned harmonica player West Weston would join later in 2013 to add some excellent harp and duet vocals on Mean ol Frisco. On this recording we wanted to re-create the Fluffy Jackets live sound, and record two tracks that used to feature in our live set, namely Woody Guthrie’s Vigilante Man and Arthur Crudup’s Mean ol` Frisco. As we had played these two songs a lot of times in the past, it would be pretty straightforward to record them. Or so we thought. In practical terms, the tracks took a while to nail as we hadn’t really planned the exact form before entering the studio. In any case both tracks were recorded in less than 8 hours, which is not bad going. 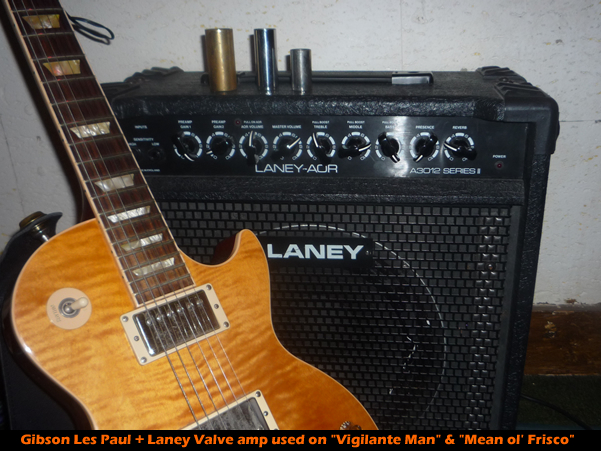 The guitar sound on these two tracks is achieved by using my Gibson Les Paul Standard played through a Laney AOR (all valve) guitar amplifier, adding a boss overdrive pedal. We also added a delay effect using a vintage tape delay instrument belonging to the Cowshed Studio. This analog tape delay retains the warmth of analog (since you actually record and playback the signal from an analog tape) and we were thereby able to recreate the 'saturation' that tape delays are famous for, which I thought was pretty cool. West Weston played harmonica through an amplifier for the Mean Ol Frisco tune. It sounded just awesome in the studio – and does on the record as well. Jerry Bessent played a Musicman StingRay bass through a Marshall 100 watt head + amp, whilst Nick Rhodes used an Arbiter drum set. In terms of drums on Mean ol' Frisco, Nick used drumming rutes (sticks composed of bundles of wooden canes) instead of traditional drums which make the drum sound on this track stand out, and the marching drums on Vigilante Man works really well. We had the studio from 10 o’clock till 2000h and it took a couple of hours to set up and get the sound right. Mean ol' Frisco was recorded live over the top of a click track to keep everyone together. The recording is pretty much done in one take, and the guitar solos and vocal were overdubbed afterwards. –Not many takes to end up with what you hear, and it definitively captures the live sound of the band. The vocals were done in one take (the first time that has happened). The engineer Joe Leach was happy with the first vocal take – so that is what you hear on this recording. West Weston’s amazing harmonica and duet vocals (he sings the second verse) was overdubbed six months later at the same studio with the same engineer. -A fun little tidbit of information regarding this, is that I had my little baby daughter with me on this session (not ideal, but someone had to look after her) and we just happened to walk into the live studio when West Weston did his harmonica recording. West, being the ever-professional musician, never missed a beat and continued to record his awesome harmonica part, with my baby daughter waving in his face. One of the great things about Cowshed is that the engineer Joe really knows his equipment, which happens to be really cool and vintage stuff. Because of this, he is quick on his feet and we get more time to actually record, rather than waiting for geeks to find out what to do. Also, he knows the sound of the room really well, so that he was able to fine-tune the sound of the drums really easily, like adding some towels on top of one drum, a pillow in the kick-drum, etc. Vigilante Man was done in a similar way, though we spent some more time to come to define the form of the song. We always do this song slightly different every time we play it live, so it proved to be a slight nightmare to get it nailed. However, it eventually got done and it has lost none of its live sound I think. 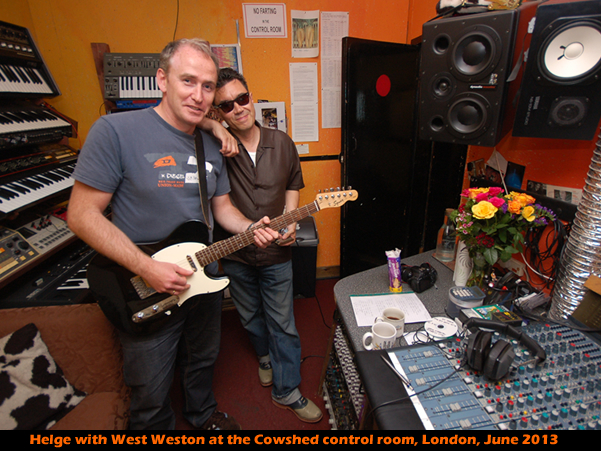 Both these tracks were finished in one day at the Cowshed Studio and engineered by Joe Leach. Both tracks were recorded on a 24 track analogue tape machine and later transferred to data and mixed digitally. Like the rest of the tracks on the album, these two tracks were mastered at Tim Turan at Turan Audio Ltd in Oxford. It was great to sit in with Tim during the mastering stage, as he did his magic on it.